KEY CONCEPT: Telling the time. DESCRIPTION FROM THE PUBLISHER: A fabulous finger puppet interpretation of this evergreen children’s game. 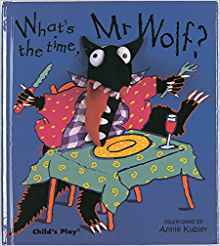 Follow Mr. Wolf and Little Wolf through the hours in their day, from waking up to the all-important dinner time. Digital and analogue clocks on each page help us learn to tell the time.